Side cabinet 2 doors left – Walnut/White. Dimensions 35x25x122 cm. Matching cabinet ref. 002626-002628-002630. Side cabinet 2 doors right – Walnut/White. Dimensions 35x25x122 cm. Matching cabinet ref. 002626-002628-002630. Cabinet with 2 drawers 80x48x51 cm – Walnut. Matches tablet basin ref. 002627. Resin top with integrated basin 80×48 cm. Matches cabinet ref. 002626. Cabinet with 2 drawers 140x48x46 cm – Walnut. Matches tablet basin ref. 002629. Resin top with integrated basin 140×48 cm. Matches cabinet ref. 002628. Cabinet with 3 drawers 120x48x42 cm – Walnut. Matches tablet basin ref. 002631. 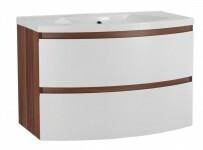 Resin top with integrated basin 120×48 cm. Matches cabinet ref. 002630.